A painting is, in its most basic form, layers of paint. 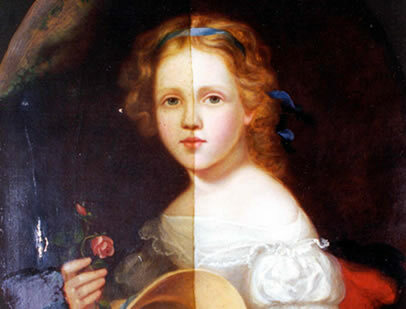 But, both the paint and its application vary among styles and periods, which means that each painting is uniquely affected by cleaning agents and solvents. So the foundation of a conservator’s practice is a thorough understanding of art history, because it’s there that the nuances emerge and a kind of deconstruction begins. In the examples highlighted here, the damage was fairly straightforward. But, more often, the full extent doesn’t become apparent until after the cleaning. It’s akin to cutting away some weather-worn siding, only to discover that a chimney leak was responsible for that and some much more extensive internal rot. Once we piece together a history for the painting, our conservators will begin by testing each pigment individually, starting with the mildest solvents and gradually working up to the strongest cleaning agents. As with any craft, study breeds skill and experience, expertise. The deeper they run, the larger the craftsman’s arsenal. Our adept staff can identify various pigments and varnishes and recreate virtually any painting style or technique. We’re constantly studying new developments in art conservation in an effort to further minimize our imprint. The treatments we employ are always museum-quality and reversible. Art conservation aims to restore color and detail, adding years of life to and maximizing the value of even the most damaged piece. We take particular pride in preserving as much of the original art as possible. It’s a matter of honoring the artist’s intentions. But it’s also a practice that ensures the painting retains its utmost value.